Bicycle accidents often result in serious injuries. Some of the most common types of injuries include broken bones, head trauma, and back and neck damage. Many of these injuries occur from falling onto a hard surface during an accident. Head injuries can be extremely serious and may result in permanent disabilities. The best way to reduce the risk of head trauma is to wear a bicycle helmet at all times. There are other safety precautions that can be taken to help prevent accidents and injuries. 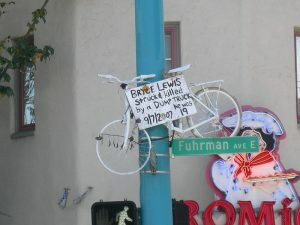 Bicycle safety is a priority to a number of people in the San Francisco area. The San Francisco Bicycle Coalition is an organization that provides information and resources for bicyclists of all ages. Part of their goal is to help educate people about bicycle safety. They are a leading resource for street safety in San Francisco, and provide residents with free bike safety education classes and resources. Contact San Francisco Bicycle Coalition to learn more about safety and to sign up for a class. Being involved in a bicycle accident can be terrifying. It is necessary to follow a few basic steps after a crash. Talk to the driver of the vehicle involved to ensure that he or she remains on the scene. Call the police immediately and report the accident. If you are hurt, get medical attention. You should also let the police know that you have been injured so it can be noted on the accident report. Recall as much information as you can about what happened, and write it down for future reference. If you were seriously hurt, you may need to take legal action. It is important to get legal guidance and support from an attorney who understands these types of cases. Brod Law Firm is a bicycle-friendly attorney with expertise handling even the most complex cases involving bicycle accidents. If you were hurt in a bicycle accident, contact the skilled legal team at Brod Law Firm for a free consultation. Call us today at 800-427-7020 to discuss your case. We have offices located in San Francisco, Oakland, and Santa Rosa (Sonoma).